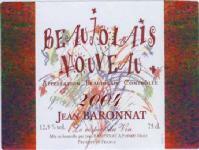 Early in the nineteen sixties, my father was on of the pionneers for the Beaujolais Nouveau wine in the Paris region. From then on, each year at the and of October or early in November he went up to Paris to present the new wine.When I was a child I often helped to prepare samples; in this way he contributed to the success of this wine which today is known troughout the world. In Paris, our wines were presented in famous places such as the Brasserie Lorraine, the Frantel, Hilton and Intercontinental Hotels and the Plaza Athenee, as well as in the very best restaurants in Lyon. The downside of the great success of the Beaujolais vineyards was relative to the fall in popularity among the clientele in Lyon due to the increasing price of these wines : my father was obliged from then on to look to the rhone Valley for wines to satisfy our local clientele, offering them at more competitve prices. This is how , over time, in addition to the Beaujolais wines, we started offering Cotes du Rhone, Cotes du Ventoux, Cotes de Provence wines.